Like baseball? Like fireworks? How about Baseball Fireworks! 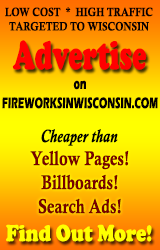 Major and minor league teams in Wisconsin with promotional fireworks nights! Where I could find them, I’ve listed the other promotions as well. If your favorite team isn’t listed here but you know they have post-game fireworks, drop me a line and I’ll add them to the list.